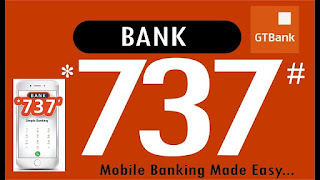 GTB Cardless Withdrawal with Guaranty Trust Bank (GTB) is one of the most convenient ways to access ATM cases, a surprise that many people do not use. This may be due to a combination of factors though. It's either people do not know about it (weak publicity) or are skeptical that it would work for those who are aware of it. Sometimes it comes down to a phobia of trying something new, especially when it comes to technology. Others do not want to bother learning something new if the old method still works. But, in addition to being very convenient, it is surprisingly easy to use. This is a service that comes in handy when your debit card is stolen, lost, damaged or you forgot to take it along with you. The Guarantee Trust Bank, GTB, introduced the cardless withdrawal last year. They called it GTRescue. But so far, most of its more than 1 million customers in more than 200 branches across the country do not bother to use it. 1. Using the mobile banking code * 737 #. Search and click on the "Withdrawal without card" option. It should be on the next page so you may need to select "8" to get to the next page. Then select "1" or "2" depending on the ATM you want to use. The first option for the ATM GTB, while the latter option represents the ATMs of other banks. Then enter the amount you need to withdraw and click "ok"
You will then be prompted for a 4-digit code. This would be your "serve pin" when you get to the ATM. This option is only applicable when you use the "Other bank" option. A "Payment code number" would be sent to your mobile phone if you decide to withdraw using the "Other banks" option. Except for any failures (which sometimes occur due to network issues) your account would be charged immediately for the amount you wish to withdraw. You would receive a notification of the charge on your phone. More importantly, as far as the transaction is concerned, you would also receive a 12-digit reference number (Ref) via SMS. Take note that the Ref number would be required when you go to the ATM to withdraw your money. This the method only works if you have a smartphone compatible with the GTB application known as GT-World. If you do not have it yet, you can install it from Play Store or iTunes for Android and Apple devices respectively. Then click on "Withdraw cash (GTBank ATM)" if you wish to withdraw from a GTB ATM. Select the option 'Withdraw (All TA and POS)' to withdraw from the ATMs of other banks. Enter the required information correctly in the form that is shown and click "Continue" when finished. Then, enter your PIN or 4-digit token code to complete the process if you have the token hardware. A reference number will be sent immediately to your phone via SMS along with a notification of the debit made in your account. A "Payment Code Number" will be sent to your phone to be removed from other banks. For this method, you must log in to your Internet banking portal. Although the process is a bit tedious. The personal information you need to provide takes too much time. Also, if you do not have a hardware token, the transaction will not be processed. However, if you must do so, you can start it through the online banking portal of GTB. Click on 'Account transfers' followed by 'Withdraw without card'. Fill in the form and provide all the required details. If you wish to withdraw from a non-GTB ATM, click on "GT Paycode" instead of "Without withdrawal of card" in "Account Transfers". Follow the notice, provide all the details and you're done. You will be asked for the reference number. Enter the 12-digit number we send you. Then, enter the amount you wish to withdraw. Make sure it is the same amount when you started the application. Press 'Enter' to complete the transaction. Your money would be delivered to you. Start using GTB Cardless Withdrawal today and never get stranded again because you forgot your ATM card at home. Have you used GTB Cardless transaction before? what is your experience? Share us your experience via the comment and never forget to share this information to your friends and relatives to know How do I use GTbank cardless withdrawal.